Boys Under 15arrow-rightCreated with Sketch. 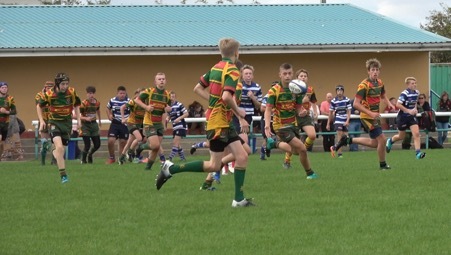 The U15s Boys opened their 2018-2019 season by travelling to the South Yorkshire home of Thornesians on Sunday. The match was one of ‘development’ for Thornesians having re-built their team since last season and Selby were keen to put their contact skills back into motion after the summer break. The play was dominated by Selby for most of the match with the whole team working strongly together to pass, drive, win scums and put the opposition under pressure at all opportunities. Thornesians continued their determination despite the large score gap and monopolised on Selby’s errors in defence near the score line seeing them score a try in each ½ of the match. Selby’s tries were from Hardegon (3), Abrams (2), Bishop (2), Scholefield (1) and Gabel (1). Conversions were from Hammell (5) and Simpson (1). The match saw many ‘firsts’ for the Selby side. First try for Hardegon, which with 2 further tries became his ‘first hat-trick’ for the team, winning him man of the match from the opposition and a ‘first conversion goal’ for Simpson having only started goal kicking during this match. Building on and learning from this first win, Selby are now looking forward to the rest of the season with matches against old adversaries and the first round of the U15s Yorkshire Cup on 30th September.